Dabbling in the eclectic art of "homemade". My mom used to make it when I was small and then my wonderful stepmom after her, and every time I would come home to the delicious scent of baking bread, I really felt like I WAS home. It completed the sensation. We would all clamor for a piece fresh from the oven and would eat it warm with butter melting into it. The gods couldn’t sit down to a finer feast than a board laid with fresh, homemade bread. So when Auntie Linda offered us her breadmaker a few years ago, I eagerly accepted and used it faithfully for a few months until the novelty wore off. Then it sat, idly collecting dust on my counter, until I tucked it away to its new home beneath the microwave where it sits and collects dust now. It probably won’t make the trip to Nova Scotia. That being said, I wanted to share my fondly remembered childhood experience with Toby and so I rolled up my sleeves and tried to make my own homemade bread. 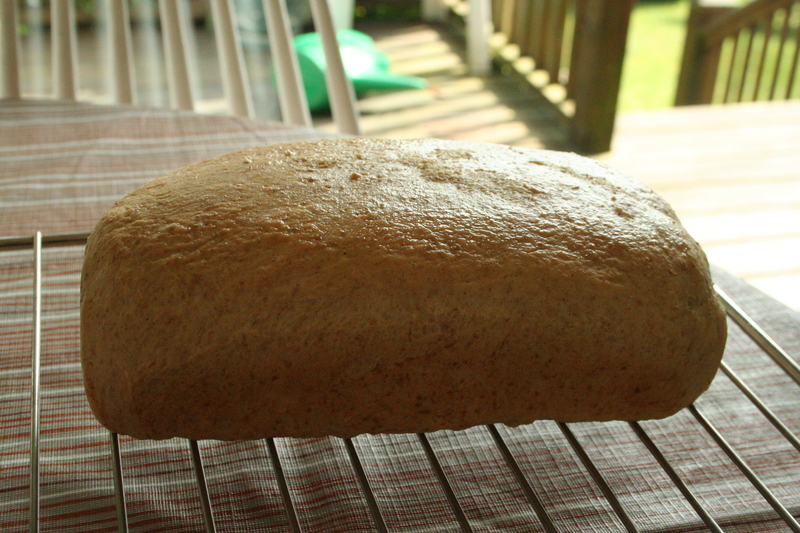 Attempt #1: Classic Whole Wheat Bread. I had all the ingredients in my cupboard. Merrily, I mixed and kneaded and rose. Alas, I was the only one rising. The first batch turned out this way. Not good for much… except maybe slicing into hockey pucks, or putting into a rocket launcher. I blame it on the yeast. Because I blamed it on the yeast (which in truth really was pretty old), I went out and bought a fresh jar and made another batch of the same. Attempt number two turned out a little better. Classic Whole Wheat Bread, batch #2. We’re getting there! …I think. A bit dense, perhaps, but it really wasn’t bad. Maybe it just called for a little more kneading. I thought that since this loaf was getting closer, I could try a different recipe. 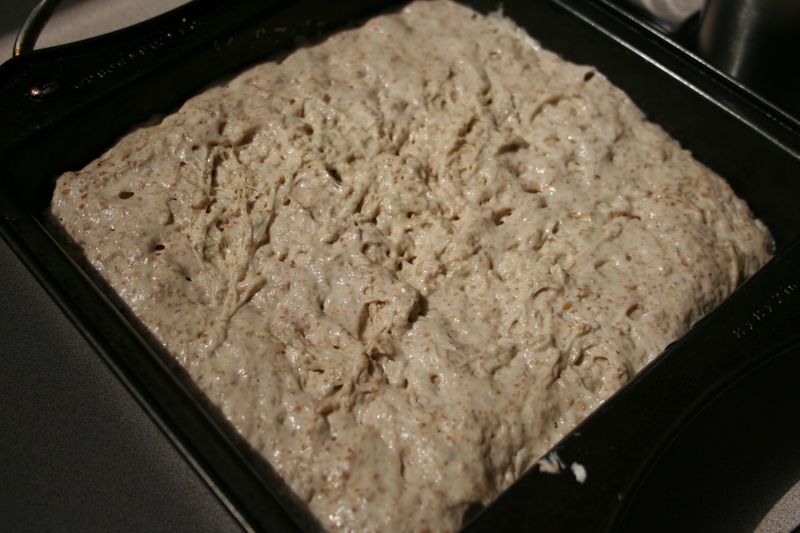 Oatmeal Brown is one of my favorites and so armed with fresh yeast and confidence, I went hunting for a recipe. The website I stumbled upon, Cooking With Candra, is fabulous. She has really clear step-by-step instructions and even has videos on how to know if you’ve kneaded your bread enough. I diligently watched her videos and took mental notes of her techniques and tips and then set to work. While I was pouring the molasses into the dough, I remember thinking that waiting for it to dribble, painfully slowly, onto the tablespoon was going to take longer than the rest of the process. That silly notion tempted the Fates to dole out some punishment. I began kneading with a right good will and after the approximate allotted ten minute mark, I did the window pane test that Candra describes. No good. So I kept kneading. And kneading. After 45 minutes of straight kneading, my forearms burning like scrawny torches, I gave up. And it still wasn’t right. 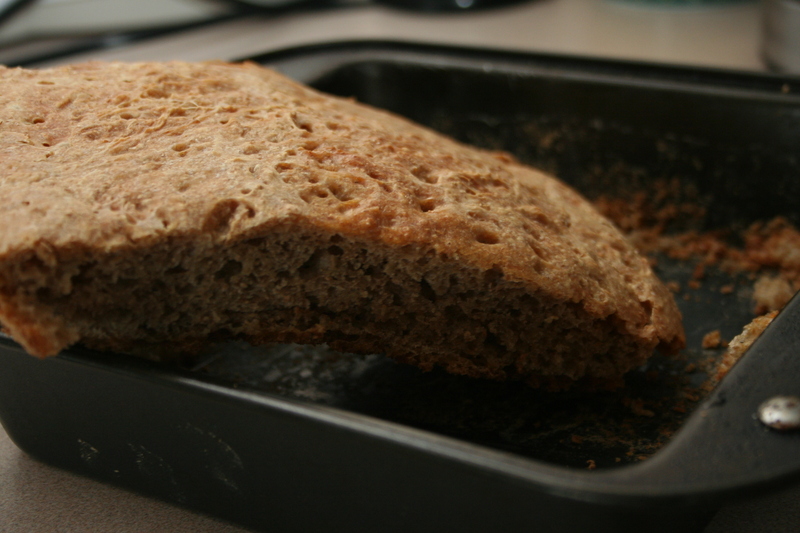 Daunted, I carefully dropped it into the greased loaf pan to rise anyway. The bread itself was still dense and every slice was striped with a hearty dusting of flour. My guess on this one is that I put too much flour. The dough WAS pretty dry while I was kneading. Somewhere in the recesses of my brain I remembered hearing that in a case like this, you just wet your hands and that would help loosen the dough and fix up your overzealous flouring. It helped a little bit to incorporate some of the flour, but clearly… not enough. My final attempt was a recipe that I figured was pretty much fail-safe, considering one of the posts I found it in said it was so easy that a four year old could make it. Also, no kneading sounded pretty good to me after the oatmeal brown colored disaster. But because it takes so long to rise the first time around, you kind of have to plan ahead to get this bread made. My planning skills can sometimes be lackluster, so I didn’t get around to making this batch until about a week after the last loaf I attempted. I started the first step with a positive attitude that even Mary Poppins would be jealous of and popped the dough into the oven to rise for the required 18 hours. The next day, I pulled the bowl full of fluffy dough out of the oven and happily dropped it into the pan. This one looked like it could be the winner. All signs pointed to a perfect loaf of bread and I covered it with a plastic bag (since I don’t buy plastic wrap… to me, that’s just like tossing money into the garbage) and set it on the table to rise for the remaining 2 to 3 hours. Then I forgot to put it in the oven to bake and when it had been rising for about 2 hours, I gaily tripped off for a lunch outing with my former workmates. Partway there, I remembered it with a gut-wrenching halt but quickly forgave myself. If it rose longer, I figured, it would just be lighter. When I got home from lunch, I turned on the oven and went to grab the pan to check how it rose. I couldn’t find it on the table at first, and then I found it… under a pile of newspaper that Scott had been reading. To be fair, I didn’t warn him that it was rising there. But… gahhhhh. It did not look like it was in high spirits. I put it in the oven anyway and waited. The house filled with the wonderful smell of baking bread and Scott was drooling, waiting for it to finish baking. When I hopefully pulled it out of the oven, it looked pretty much like the picture on Michael Smith’s website and I took heart – finally, a loaf of bread that worked! I upended the pan over the cooling rack to knock it out. Nothing happened. I paused. And then I shook. I shook more vigorously still. Nada. I forgot to grease the pan. Well, it still TASTED pretty good… after we gouged it out of the pan. But I think you will agree from looking at the picture that this one was, as the kids say these days, an Epic Fail. Perhaps I’ll give it another attempt when we’re settled in the new house with a working kitchen (so… sometime after the New Year, I guess). In the meantime, I’ll do some research and see if there are any earth-shaking tips that I can follow when I try my hand at this again. Or… there’s always the frozen, pre-made stuff at the grocery store if I really need to relive my childhood. So, dear reader, can YOU help? 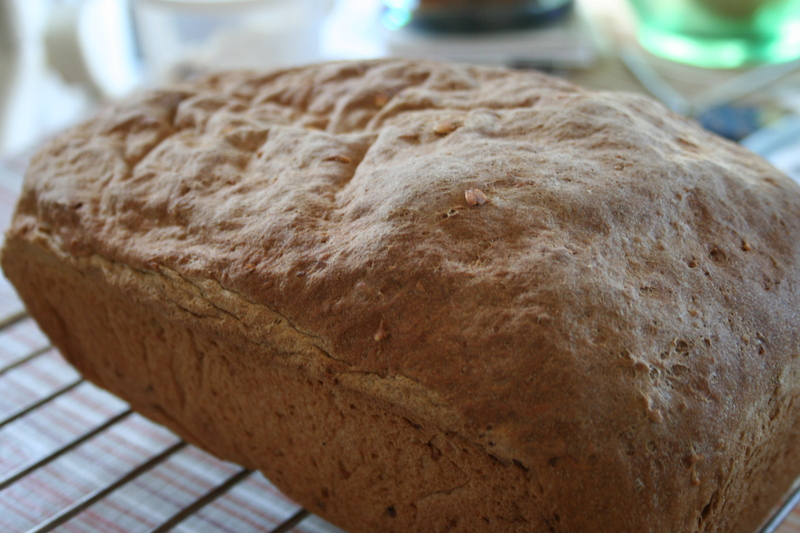 If you are well-versed in the world of bread making, what is your secret? I have had similar experiences with baking bread! I have Mom’s recipe, which seems so easy and straightforward; however, it never turned out for me. Maybe I need to try more than once. Many things can affect the bread: old flour or yeast, humidity, temperature, rising time, etc. I’ve pretty much decided that if it tastes good, that’s what counts! Or, if it turns out funky looking, I’ve started painting the bread (with edible paint of course). Or cut it into squares and make croutons. Or cut it into shapes with cookies cutters… no one will know the difference except you. Awesome, thank you for the tips! I did not think so creatively about my failed attempts… but I wish I had thought of croutons, that’s brilliant. Thank you so much for reading and passing on your expertise! I say it IS worth it (although I’ve never made it myself on account of the awesome Portuguese bakery a block away). You can’t beat the homemade bread. Although I haven’t made bread, Dave has often done so using Mom’s recipe and it turns out pretty good. During one of her visits here in Edmonton she gave a little bread baking lesson and Dave video taped it. I have a copy of that and will use it one day. I would love to get my hands on that video! Aunt Mary DID make the best bread. I assume Mom had the same recipe. I think I have it… when I’m brave enough to try again, I’ll try that one. 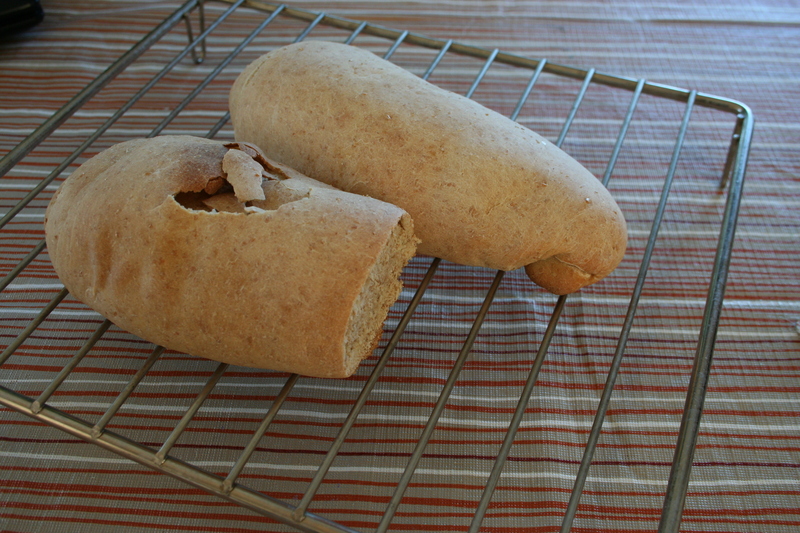 I used to make bread all the time when we lived in NL. I decided to make some again not to long ago after many years. It was a failure, and I blame it on the yeast! All I can ever find is quick rise yeast. Not sure how to use it correctly. I never had a recipe per say, just throw all the ingredients in a rubbermaid pan and mix it up until the consistency felt right. Let her rise and kneed twice before putting it in bread pans and then let it rise again. Bake at 350 and wala! Grease the top with butter while still hot! Yummy! I may have to try again one day. I just wish I could find the old style yeast. Hmm. Interesting, I never looked to see what kind of yeast I was using! I just looked now and it’s Traditional by Fleishmann’s. I had no idea there was a difference!